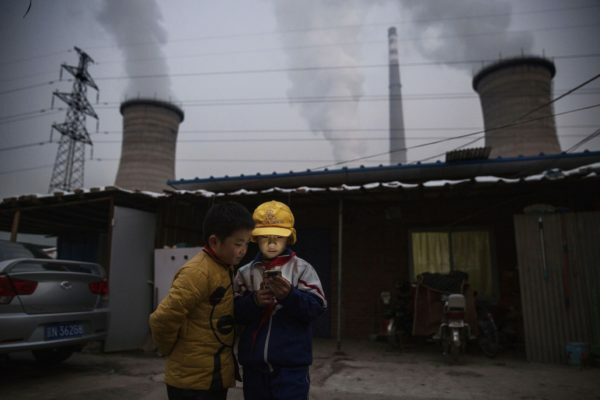 Two boys stand outside their house on the outskirts of Beijing, in the shadow of the nearby coal power station. Photo: Kevin Frayer/Getty. Chinese energy companies have been starting two coal power projects a week despite a recent government policy designed to tackle the country’s overcapacity crisis, according to a new Greenpeace analysis. China currently has over 900,000MW of coal-fired capacity, the equivalent of about 1,300 large coal-fired units. But, due to the country’s slowing power demand growth and rapid expansion of clean energy, demand for power generated from coal has been falling since 2013, rendering roughly 200,000-300,000MW of capacity redundant at 2015 demand levels. Yet China has another 200,000MW of coal-fired capacity under construction, and a new Greenpeace analysis has identified a further 150,000MW of projects potentially able to enter construction — despite recent suspensions. But the effects of loopholes in the policy are already showing. Mapping shows that in the two months after the policy was introduced, new coal power plants projects started construction at a pace of two per week, with new projects started in ten different provinces. Furthermore, six new ‘coal power base’ projects in Shaanxi and Inner Mongolia – with over 9,000MW of capacity – applied for environmental permits immediately after the policy was published, making May the busiest month of 2016 for new applications. These new projects could go ahead because the policy contains exemptions for many provinces, for projects designed to export power from the west to the east and for combined heat and power projects. On the other hand, preliminary information on China’s new energy five-year plan broke out yesterday from a government-controlled media outlet, indicating a more complete ban on new permitting will be forthcoming. 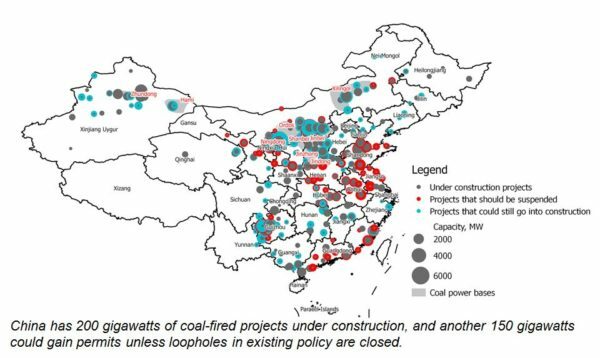 However, even without any new permits for conventional coal plants, there is still enough capacity under construction or allowed to go to construction for China to keep adding one GW of coal-fired capacity per week for four and a half years, until the end of 2020. This would mean about 1.1 trillion yuan ($160bln) spent on redundant capacity. 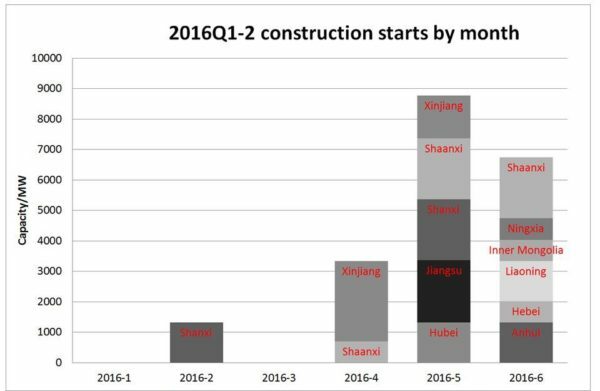 The top two provinces, Shandong and Shaanxi alone would have approximately 250 billion yuan worth of redundant capacity. Chinese energy industry publication Southern Energy Observer recently collected comments on the overcapacity situation from market participants across the country, and one phrase got repeated half a dozen times: the power industry’s “winter is coming”. A commentator from the northeast said that the industry had anticipated a central government clampdown on new permits and rushed to grab permits at the last minute, with a lot of poorly planned projects going into construction. A Cantonese reader noted that nuclear, hydro, wind and solar are competing with thermal power, resulting in a lot of existing units standing idle. Yet, more coal power units are under construction, surely worsening the situation and risking waste of capital. A commentator from Xinjiang, in the far west of the country, lamented that the prospects for the massive fleet of new coal-fired power plants under construction in the province, equal to the total coal-fired capacity of Poland, are not bright: the plan is to export all that power to the eastern provinces but those provinces themselves have overcapacity. Another commentator from Shandong, one of the relatively developed eastern provinces and a major destination for planned power exports from the west, said that capacity utilisation in the province would fall below 50% when the new transmission lines from west to east start to operate. These comments highlight a key finding of Greenpeace research: almost all provinces in Northwest, Southwest and Central China plan to export large amounts of power, but there isn’t going to be a supply deficit anywhere in the country. So far, the allure of loose credit has trumped administrative controls, but the government seems determined to take stronger measures.